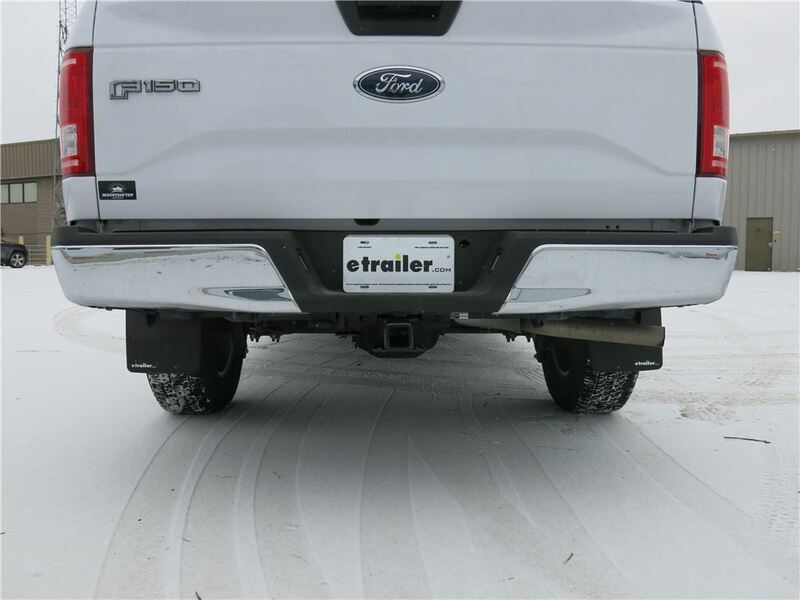 WeatherTech mud flaps for your 2016 Ford F-150 are available from etrailer.com. 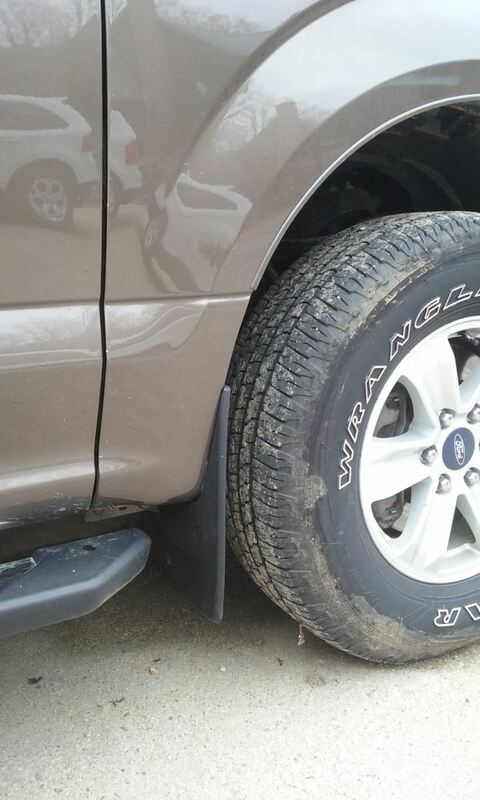 Installation instructions and reviews for your Ford mud flaps. Expert service, and cheapest mud flaps price guarantee. 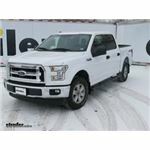 etrailer.com carries a complete line of WeatherTech products. 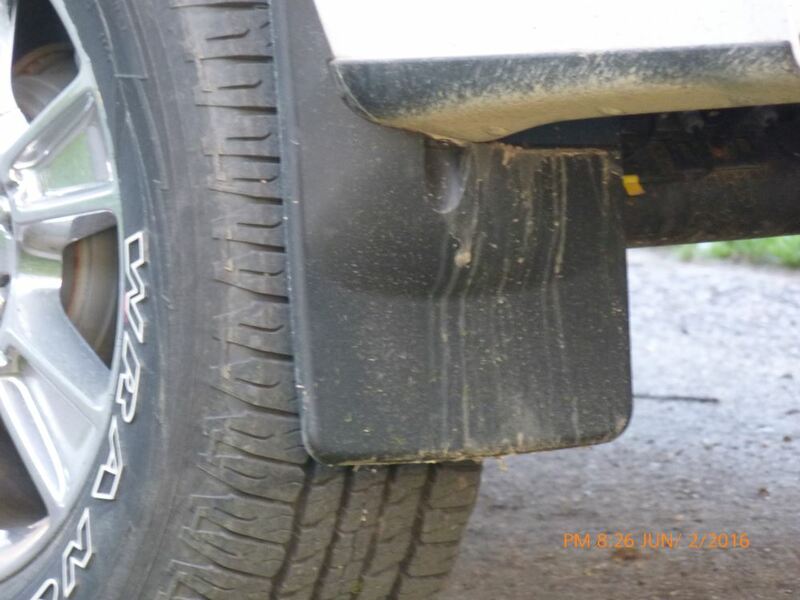 Order your WeatherTech Mud Flaps - Easy-Install, No-Drill, Digital Fit - Front and Rear Set part number WT110050-120050 online at etrailer.com or call 800-298-8924 for expert service. 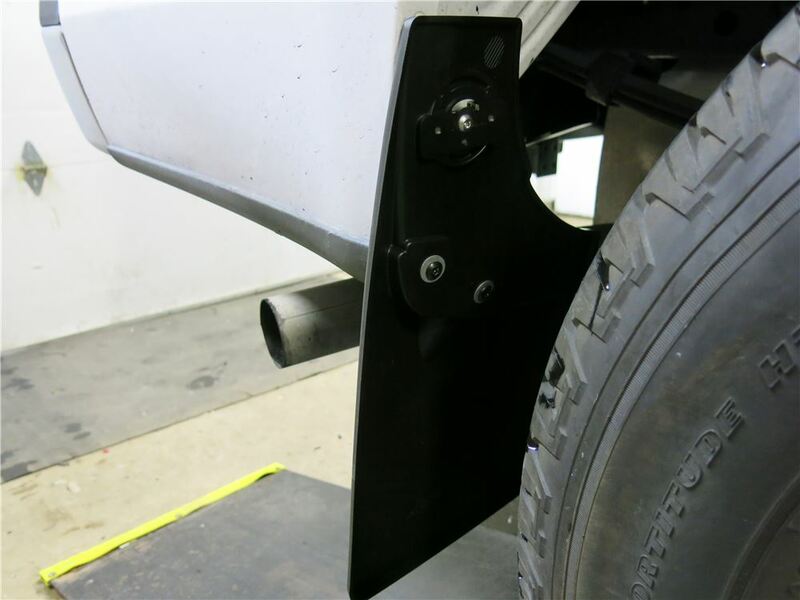 These premium mud flaps are easy to install and digitally designed for a perfect fit. 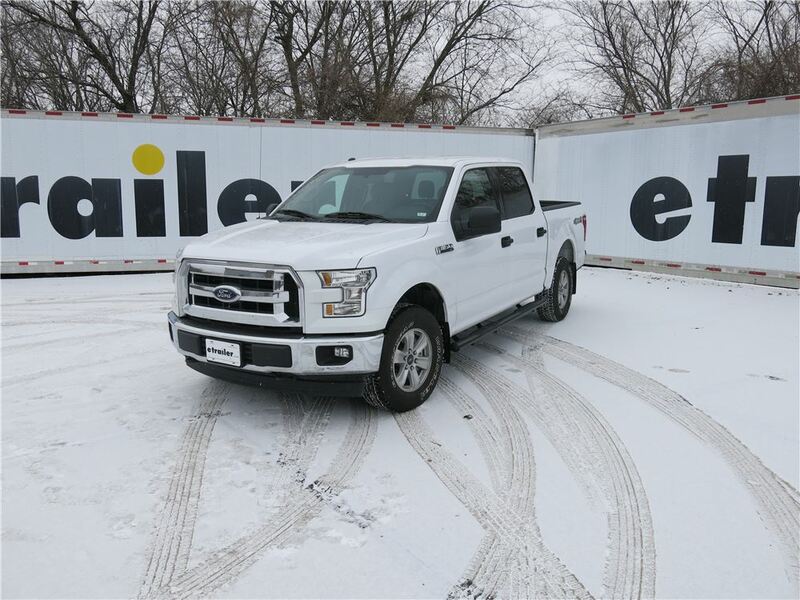 Protect your Ford F-150 and your trailer from road debris. Flaps are constructed of durable thermoplastic resin with stainless steel fasteners. 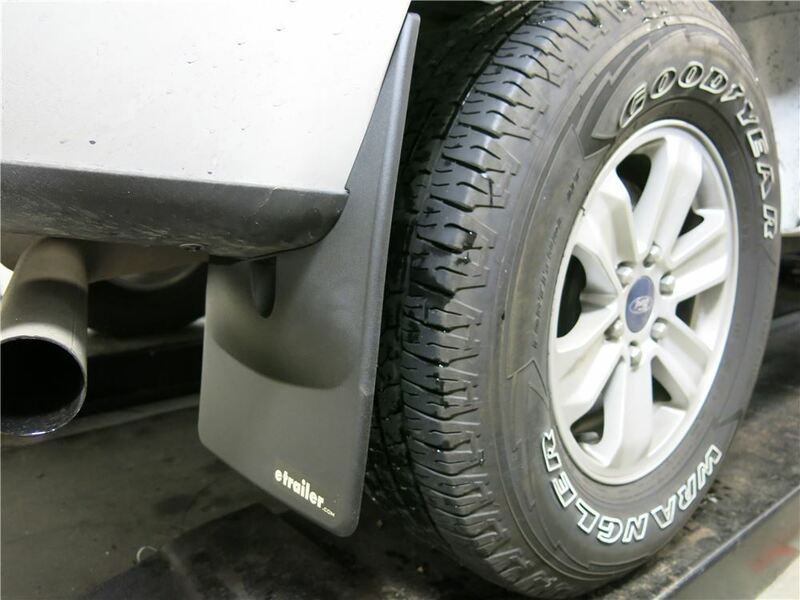 Precision fit, durable components and ease of installation make WeatherTech NoDrills your first choice in mud flaps. Installing mud flaps has never been this painless. Patent-pending QuickTurn stainless steel fasteners makes installation quick and easy - no drilling required. Speaker 1: Today we're going to be taking a look at the WeatherTech line of easy-install no drill mudflaps. These WeatherTech mudflaps are going to offer a very quick, easy installation, and they're going to give us great protection. On the front, they help out a lot with the bottom edge of the vehicle underneath your door or doors here. Also, if you have any kind of tube sets, these help to prevent rocks and debris from being thrown up, nicking those, eventually causing corrosion.Now, in the rear, they're designed to give protection for our vehicle of course, but more importantly, anything that we might be hauling, whether it's a camper, a car carrier, a boat, or for that matter just motorists traveling behind us. These are drastically going to reduce the risk that we're going to be flinging rocks or debris up where it might hit one of those items. Now, these WeatherTech mudflaps are designed different for every application. They're going to follow the exact contours of the vehicle, and they give it a really, really nice look. Here, in the front, you can see the same thing. It really follows that contour really nicely right over around the bottom edge, giving us good depth of coverage, even if you have slightly oversized tires. Now, to help ensure that our mudflaps last for a very long time, they're constructed of a thermal plastic resin. This is going to help to resist any cracking, any breaking, and also offers some UV resistance. We won't have to worry too much about fading.Now, in looking for our reviews, two things seem to really stand out. First is ease of installation. Typically, under 15 minutes, you're going to have your full set installed. The next thing that seems to really stand out is the custom fit, and how securely they're attached to the vehicle. Now, in most applications, you can choose just the front, just the rear, or the complete set. Now, the biggest advantage I see with the digital fit style mudflaps is that we don't have to drill through any metal ever. 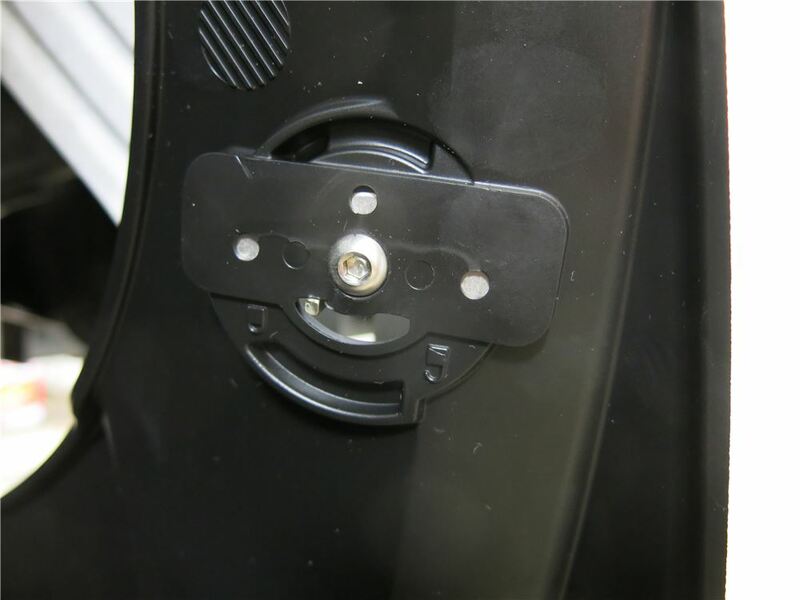 Depending on your application, you're going to have holes in locations that are already existing on your vehicle. 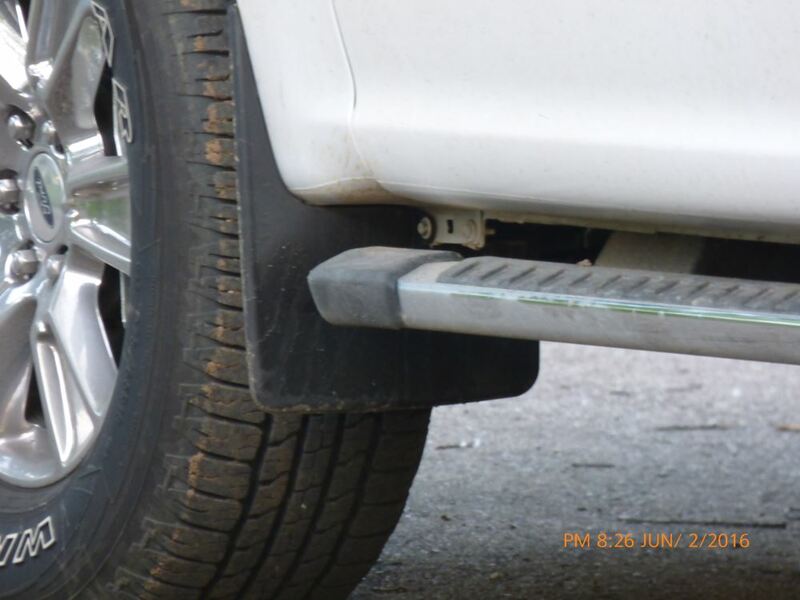 Occasionally you might have to drill through a fender line or something, but never through steels.Now, in some applications of our mudflaps, we really don't use any hardware in the vehicle, like in the rear area of our wheel well in this application. You'll see on the front side we're going to have the little cap bolt. Now, as you turn that, you see that that's going to rotate that, and it's actually going to pinch the body metal between the two pieces at two points, getting it nice and secure that way. There's going to be a little catch down here on the bottom in this application that also helps hold it on. They use a couple different styles. The variety of attachment points really helps allow for many different applications.That's going to complete our look at the WeatherTech line of easy-install mudflaps. Order: RelevanceNewestRating - High to LowRating - Low to High These premium mud flaps are easy to install and digitally designed for a perfect fit. Protect your vehicle and your trailer from road debris. Flaps are constructed of durable thermoplastic resin with stainless steel fasteners. The things worked great. Went to Alaska and traveled lots of muddy roads. The mud did note cake up along my running boards like it used to. I believe they saved my trailer from severe rock damage. You are correct they are not a fit for the wheel lip molding on your Lariat model 2018 Ford F-150. They are a confirmed fit for models without the molding in your photo. 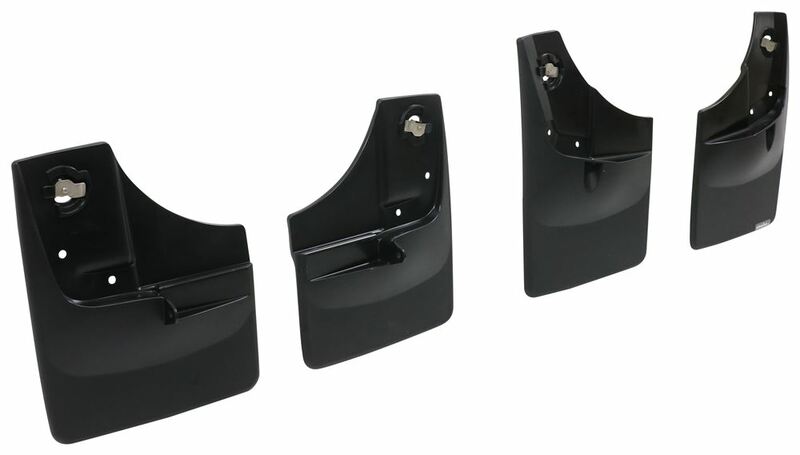 Instead you will need the WeatherTech Mud Flaps - Easy-Install, No-Drill, Digital Fit - Front and Rear Set # WT110044-120044 which is a fit for the wheel lip molding of your truck. The WeatherTech Mud Flaps # WT110050-120050 will require you to either use a trim clip remover to take out the factory plastic rivets; if you take a look at the part of the instructions I've attached it shows you the necessary step you'll need to take. If you only wanted the rear flaps that would be # WT120050 while the front is # WT110050. I've also attached a link to a video review of these guards for you to take a look at. For both front and rear mud flaps for your 2017 Ford F-150 without the factory add-on fender flares I recommend WeatherTech mud flaps # WT110050-120050. This is a no-drill, custom fit installation for your truck. I have linked the installation details for you. 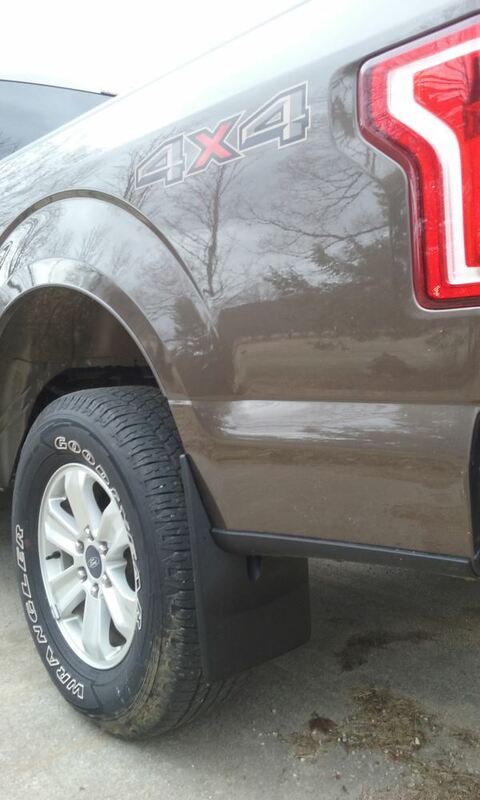 Yes, the Weathertech Mudflaps part # WT110050-120050 that you referenced are a confirmed fit for your 2016 Ford F-150 without factory fender-flares. The box just has outdated fit info. We confirmed with Weathertech that these carry over to the 2016 models too.